Very quiet pump designed to work with a pressure controller ON/OFF, or by a variable frequency drive for fully automatic operation as a booster set. Quiet horizontal multistage centrifugal pump, ideal for domestic pressurization and gardening. Manufactured with strong materials for a long time operation. IMpellers and diffusers in AISI 304 stainless steel, suction and discharge body cast iron. Single-phase motors with built-in thermal protector and capacitor. 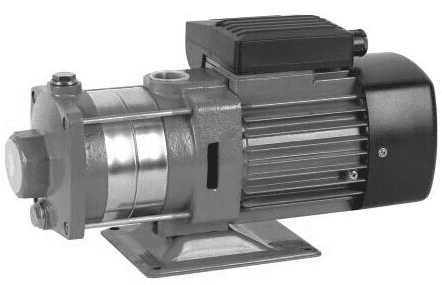 Pumps designed for the supply of pressurized water in houses, apartments, for watering gardens, washing cars, filling tanks, etc. Booster set pressure controller for automatic start and stop operation. Centrifugal horizontal quiet multistage pump, ideal for domestic pressurization and gardening. Manufactured with strong materials for a long time operation. Quiet multi stage horizontal pumps made with all components in contact with water in stainless steel AISI 304. Quite horizontal multistage pumps made with impellers in stainless steel AISI 304. Quiet domestic booster sets supplied "plug &amp; pump" with the latest generation of pressure controller ON/OFF for automatic operation. Quiet booster set for domestic and industrial applications, for constant pressure supply, with integrated frequency inverter. Quiet,horizontal, multistage,centrifugal pump, fully manufactured in stainless steel 304 (optional AISI 316). Easy disassembling of clamp fixation.